Artists Laura Gunnip and Robin Doggett were proud to represent the Methow Valley at the 2016 SGC International Print Conference recently held in Portland, Oregon. Fine art printing and publishing artists and professionals converged to discuss, exhibit, and demonstrate the latest ideas and techniques. Print studios and galleries throughout Portland featured inspiring work at the Print Conference. ‘It really brought home how Door No. 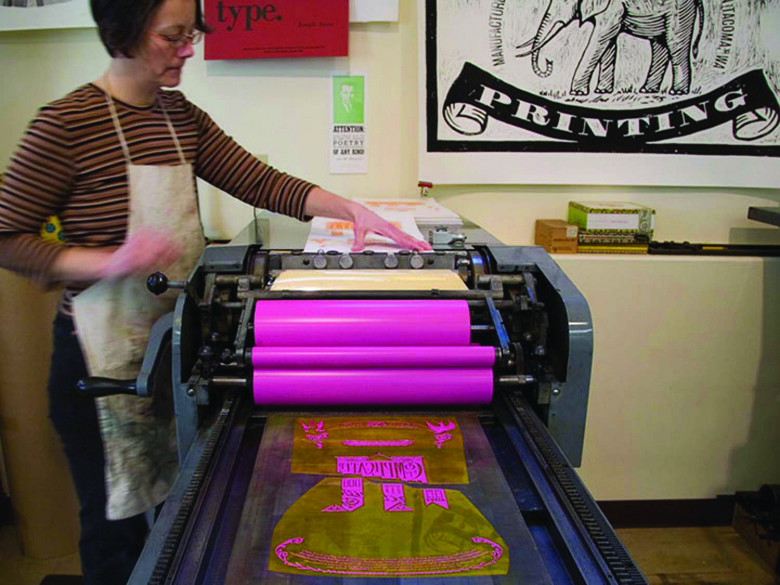 3 has achieved a top-notch print studio right here in the Methow Valley,” enthuses Gunnip. Door No. 3 had the opportunity to drop in and visit fellow letterpress comrades in their studios including printing mentor Jessica Spring at Springtide Press (springtidepress.com) and the letterpress print aficionados at Stumptown Printers (www.stumptownprinters.com). And there’s word of an upcoming collaboration to be shown in the Spartan Art Project as a result… stay tuned. CONTACT: 509.449.1789, info@doorno3.com. INFO: www.doorno3.com. To see a photo gallery of Door No. 3 photos from SGCI Flux Conference in Portland go to: www.doorno3.com/sgcifluxportland.